Trying to manipulate a continual succession of bloom in the garden is part art, part science, and a good part luck. Weather, grazing animals, and flowers that don't follow the seasonal changes can create lulls where no plants seem to be at peak performance. Who thinks about planting for the fall when spring bulbs are just starting to bloom? There are a few tricks to keeping color in your garden going throughout the summer. They take a little effort, but that's the fun of gardening, right? Implementing any one of these tips will increase the blooms in your garden and spur you on to do more. Okay, deadheading is tedious and boring, but removing spent blossoms is the easiest way to keep plants blooming for as long as possible. Annual flowers will especially benefit from periodic deadheading. A flower's main job is to produce seed. Once the plant sets seed, it has no more reason to produce flowers. Prevent it from setting seed by deadheading and it will just keep on flowering. Many perennial flowers will also rebloom if deadheaded. Exceptions are perennials that bloom on a single tall flower stalk, like astilbe or iris and perennial flowers that need a chilling period to set their flower buds. To deadhead, simply snip the entire spent flower stalk off the plant as close to the base as possible. For flowers that have multiple buds on one stalk, you can either cut down to the next unopen bud or check out tips 2 and 3. Plants that produce multiple flower buds on their flower stalks can be a nightmare to deadhead. Rather than trying to deadhead every flower, wait until the bulk of the buds have faded and shear the plants by about 1/3. This serves to rejuvenate the plant and will send out new fresh foliage and lots of new flower buds. 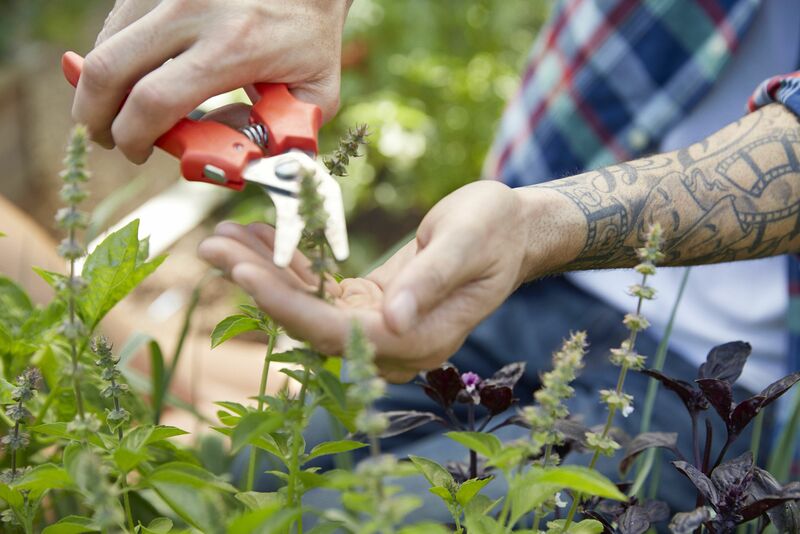 Newer gardeners have a hard time with this drastic approach, but give it a try. The plants recover quickly; early bloomers start to look bedraggled by mid-season anyway. In fact, if you have plants like perennial geraniums and Brunnera, whose foliage fades after flowering, shear the whole plant back to the new growth at the base and watch how quickly and how well they recover. A clever way to prolong the perennial blooms is to prune the plants in steps. Visually divide a clump of 1 type of plant into 3 sections: front, center, and back. Once the plants get about 6-8" tall, prune the front and center sections of plants by 1/3 to 1/2. Let the whole clump grow another 6-8 inches and then prune just the front section by 1/3 to 1/2. This type of pruning will result in your single clump of plants turning into 3 levels, or steps, that will bloom in succession. Instead of one flash of bloom, the rear section blooms first. As it fades, the center section starts to bloom and hides the fading plants in the rear. Last to bloom is the front section, which will grow taller and hide all the fading plants behind it. Annuals are touted as a great way to keep your garden blooming all summer. Given the right care, annuals will work their hearts out for you. Some annuals, like the cleome and tall verbena, don't respond to deadheading. They bloom and run out of time before they can set more buds. To prolong their bloom, re-seed quick growing annuals about 4 weeks after the initial seeding. If you started your garden with seedlings, you can direct seed at the same time you plant the seedlings. The second batch of plants started from seed will grow and peak after the first plants or seedlings begin to fade. Plants expend a lot of energy flowering. The more they flower, the more food they need. Even if you added a controlled release fertilizer at the beginning of the season, your flowering plants will need a boost every 3-5 weeks. A balanced, all-purpose fertilizer will suffice, but if you really want to kick things into gear, try a dose of super or triple phosphate. Phosphate is especially good for root development early in the season and for boosting bud set. More isn't better, and phosphate isn't a substitute for a balanced fertilizer, it's a supplement. Flowers come and go, but foliage just keeps getting bigger. It keeps getting easier and easier to have a riot of color in the garden without a flower in sight. Shrubs like 'Black Beauty' Sambucus, chartreuse and bronze sweet potato vines, screaming orange cannas, and the pale pinks and cream of Weigela 'My Monet' can either complement, augment, or even replace the flowers in your garden. We haven't even mentioned the rainbow available in coleus. Sprinkle your garden beds with a few hardy shrubs and sprinting annuals and you'll never be without a spot of color.